Asbestos removal services from Zero Defects restore a clean and healthy environment. 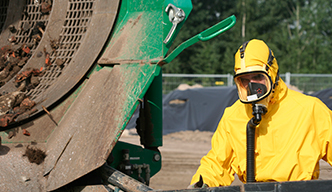 Our asbestos abatement contractor use the latest equipment to effectively deal with this carcinogen. Extensive training and experience enables us to ascertain whether the asbestos on your premises needs to be sealed or removed. By offering the right solution, we help save you time, money and stress. Over the years, we have helped hundreds of property owners with cost-effective remediation. Many older residential and commercial buildings in Ontario contain asbestos. 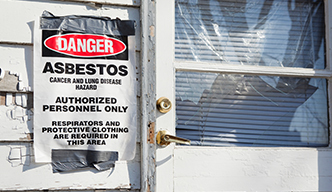 Prior to discovering its deadly effects, asbestos was used in many construction materials including water pipe insulation, roofing and siding shingles, wall and attic insulation, and vinyl floor tiles. Asbestos only poses a problem when its tiny, almost invisible asbestos fibres become airborne and the hazardous material can be breathed in. They can get trapped though out the house contaminating, floor tiles, popcorn ceiling, and destroy the air quality of the house. The friable asbestos metrials can reach the lungs and remain there causing health hazard or even life-threatening illnesses such as Asbestosis, Mesothelioma and Lung Cancer. 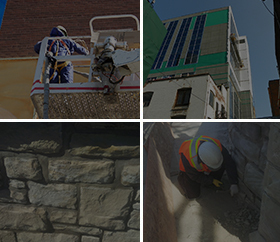 As an established building restoration company, Zero Defects has the expertise to conduct safe and effective remediation for your entire property. The longer you are exposed, the bigger the risk. The only way to know if you have a problem is through a meticulous asbestos inspection. We use the latest asbestos testing equipment and procedures to determine the extent of your problem as well as decide on the next steps. 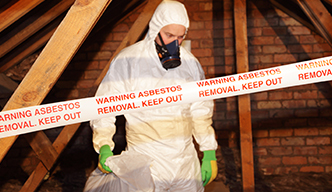 You can count on our asbestos removal experts to resolve your problem in a safe and efficient manner. We have invested in cutting-edge equipment and hired experienced technicians to get the job done right. Our inspections are thorough and detailed, so we are able to detect even the slightest trace of asbestos. All findings are sent to an authorized, independent laboratory to ensure maximum accuracy of results. We also take proper precautions to contain the affected areas and eliminate the risk of spread and unnecessary exposure. If your building is more than 30 years old, get it tested for asbestos. The longer the exposure, the greater the risk of your occupants getting seriously ill. Don’t take that chance. Worse still, don’t hire inexperienced or unqualified contractors who could worsen the problem. The certified asbestos removal professionals at Zero Defects will tailor solutions to meet the requirement and scope of your remediation project and ensure maximum effectiveness. Call Zero Defects at 416-398-9376 for a meeting to discuss your asbestos testing and removal plan.